The daily chart of the Nasdaq formed a Bullish Engulfing candlestick pattern today. The Nasdaq chart also shows a Parabolic SAR buy signal today. The Nasdaq is the first of the major indices to form a bullish candlestick pattern; however, here’s the problem. The Nasdaq overnight futures are down big as of 7:10 PM Pacific time. Folks, I think we have to respect the Nasdaq futures market over the daily bullish signals because the futures market has a catalyst: Apple. Apple cut its quarterly sales forecast after market close today with Tim Cook blaming slowing iPhone sales in China. The problem is much bigger than China. The Android operating system is on 80% of the world’s phones today. Apple made a big mistake by not joining the Android consortium and committing to an open source O/S. Apple went from having 80% of market-share for smartphones in the early 2000s as they pushed Black Berry into bankruptcy, to now only having about 20% of the market-share for smartphones. The free market has chosen Android over Apple’s O/S. Apple compounded the problem by making Adobe and even Microsoft’s One Drive not function on its phones. Steve Jobs, and later Tim Cook’s bad business decisions are to blame for Apple’s loss of market-share. Blaming slow iPhone sales on China is like announcing you’re no longer going to report iPhone, Mac and iPad unit sales to your investors. It’s a shallow excuse that investors see right through. Apple is one of the biggest corporations in the world with a $769.3 billion market cap and as such has a big weighting on the Nasdaq. 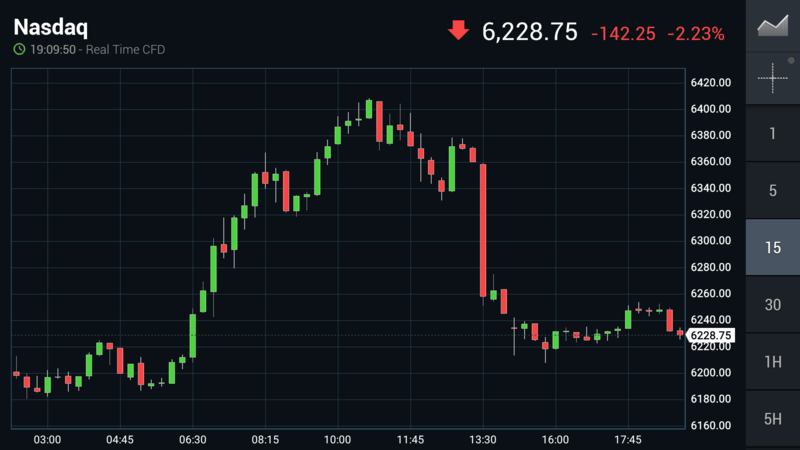 The Nasdaq was coming back during regular trading hours today but Apple destroyed the Nasdaq in after-hours trading and hence the futures market. Will institutional traders and money managers step in and buy the dip caused by the bad news from Apple? That’s the billion dollar question. There were some signs of the “January Effect” today which is the tendency to buy stocks that have been beaten down due to tax loss selling in December. However after Apple’s guidance but, traders are going to worry now that more warnings and guidance cuts are coming. Its been a good bounce over the last 4 trading days but now it will become much more difficult IMO.